How long have you been represented by Plus One Gallery? Approaching 4 years at the end of 2016 and what a fantastic modern gallery space it is to showcase exciting contemporary realist work. The development of an artist’s work is an ongoing process and should never become stagnant, this allows relevance and interest to be maintained both for the painter and his/her audience. After completing my MA I continued practising a metaphysical realist approach to my work which involved very personal subject matter based around the theme of time and memory. I worked on a series of New York paintings and drawings entitled Exploration I – XII over a three-year period, these works concentrated on a more painterly approach which simplified objects and architecture down to its bare essentials. After having a one-man exhibition of these works I then concentrated on a series of Greek landscapes and coastal scenes which involved researching and experimenting with Pre-Raphaelite glazing techniques in an effort to convey the dazzling light of the Mediterranean region. This resulted in another three years of work and subsequent solo exhibition. After completing these projects around 2005 I reassessed my approach to painting and found I had reached the end of expressing myself in a purely metaphysical way, it felt too restricting and staged. I was looking to extend and develop a more natural language of painting, one which spoke of the here and now, while still being grounded in the rich history of the European realist tradition. While studying for my MA I was aware of my tutors’ work (Prominent British painter Clive Head, Magic Realist Steve Whitehead and Hyper Realist Jason Brooks) around that time, and had a particular affinity with Clive’s agenda. A few years later I discovered the work of Richard Estes which for me was a stimulating revelation, his urban scenes of poetic precision became the only relevant starting point for a new way of working. I felt a need to increasingly tighten my painting technique and channel my subject matter purely from observing the environment around me, an objective approach rather than a subjective one. 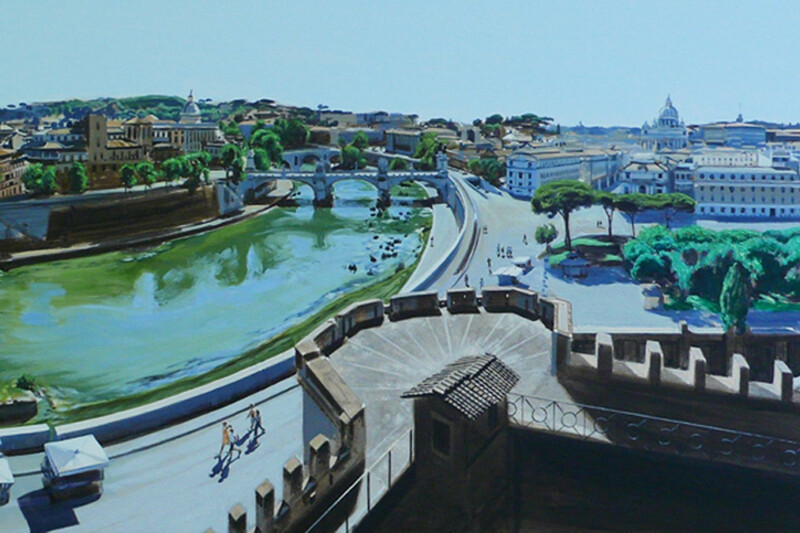 This coincided with two trips to Italy, one to Florence and the other to Rome, both these breath taking locations in terms of history, architecture and quality of light provided me with the vision to pursue my new heightened realist concerns. The process of creating a painting in its embryonic stage is one of gathering information from a given location of interest, and experiencing the unique qualities of a place, then documenting this through the photographic process. One shot provides detail; a hundred shots provides the necessary scope of vision to reference back in the studio setting. I only use a standard 50mm lens for this process in order to limit lens distortion and allow the most natural recording of the scene before me, in relation to how we use our eyes to visually make sense of the world around us. In the controlled environment of the studio I piece together the information I have gathered using photographic prints, assembling these creates a partly coherent whole, a process acknowledging the invention of Hockney’s Joiner Works. At this stage photographic distortions exist, I then work out the composition and solve any perspective problems through the process of drawing on a large scale, this involves both free hand drawing and tracing. During this process I may change the angle of a building or introduce an entirely new idea in order to satisfy my own idea of how the scene should appear. The bones and structure of the painting is worked out and finalised. In order to familiarise myself with the future work involved I produce a small study in oils which allows me the experience of what is to be expected when working on the final large scale painting, in terms of rendering surface textures, lighting conditions and colour harmonies. This also gives me the freedom to make any changes to the larger painting by visualising this smaller version. At this stage I decide on the size of the final painting and make a scaled tracing which is then transferred to the canvas after this has been stretched and prepared with white acrylic primer. The pure white surface of the canvas allows light to pass through subsequent layers of oil colour and reflect back out from this surface, creating greater luminosity. I am then at a stage where work begins on the final painting, firstly by lightly blocking in shadow areas with thinly diluted applications of oil colour using an oil medium. This first stage is allowed to dry and then I concentrate on perfecting the sky with all is various light gradations and individual cloud formations, this is also left to dry. At this stage I would start to define objects and areas in the distance using light neutral tones of thin colour. Gradually I work towards the foreground and start to define each area of the scene in order to create a harmonious whole. Using the principle of light over dark I build up the thickness of paint application to model specific objects and surfaces, this is an important contribution allowing an illusion of depth to materialise within the picture plain. Finer details and the brightest of highlights are then finally added to objects and surfaces. In the past I used a process of glazing as a way of harmonising areas, however with experience I abandoned this method and replaced it with a heightened awareness of tone and colour harmony. After a period of allowing the paint surface to dry I then add a gloss varnish to the painting, this eliminates any irregularities between areas of paint dullness and gloss which occur as a result of various thicknesses of paint being applied at different times during the making of the painting. A gloss varnish also brings out the colour intensity of the oil pigment used and provides a protective layer. Lastly I have the work framed using a plain dark wood box frame which most importantly focuses your entire attention on the world created within the frame and doesn’t detract from this as so many over-elaborate frames do. I also prefer the inch or so gap between the paintings edge and the frames inside edge which creates a kind of meditative effect while viewing the work. The ability and foresight to be aware of your own development as an artistic practitioner and your place within Art History. A belief that the importance of your own unique vision has as much to offer the world and is as valid as any artist’s achievements from the past or in the present, this attitude will result in continual advancements being made by extraordinary work being produced by you the individual. Even more important is the integrity of an artist to produce his/her own work entirely by their own hand, the idea that you can employ assistants to create a piece of art then pass it off as your own work is a fraudulent act and a disrespect to the viewing public. The difference between Rubens having assistants and Hirst or Koons having a dozen is obvious, Rubens had the initial ability to produce a sublime masterpiece whereas the other two do not. Many years ago I visited a Hirst exhibition and saw a very impressive life size marble sculpture of an angel which in parts highlighted the underlying anatomical structure of the human body. I then read the accompanying information and discovered that it had been carved entirely by an anonymous sculptor based in Italy, I thought what a disappointment!!! I have nothing against Conceptual Art I just think that when these practitioners use the skills of other people to produce their ‘own’ work it demonstrates the point that an idea alone is not sufficient and that is all they are really capable of, a resulting con trick. The main focus of your work it Italian urban landscape. Do you have a connection with Italy? My connection with Italy is purely an appreciation of the extraordinary beauty of the region both in terms of the natural landscape and the artistic legacy it created by so many heroic giants of painting, sculpture and architecture which influenced almost every nation on the planet. Reading about these great artists and seeing their works in the pages of a book during my school days had a great impact on my imagination, but being able to visit and walk around the cities where they actually worked was a great privilege and naturally these urban environments steeped in ancient history while embracing the demands of present day living provided me with plenty of inspiration to produce work. I have worked on this Italian project for 9 years and it concluded early this year, it has been a fruitful and incredibly useful vehicle for tracking my personal development into the painting genre of heightened realism. So now I am continuing to explore this approach with other urban (relating to, or characteristics of a town or city) subject matter that I have accumulated over the years which I find equally as inspiring. Being based in Pontefract, West Yorkshire is very different to the landscapes you paint, where do you paint? During my BA and MA studies I was fortunate enough to use my sister’s old bedroom as a studio space rent free with many thanks to my mother and father. After graduating in 1998 I moved into a rented studio space at Yorkshire Art Circus for 9 years, a few years ago this local arts organisation managed to buy a disused flour mill by the River Aire in Castleford (hometown of Sculptor Henry Moore) so I am now lucky enough to rent a new studio with a riverside window view in Queens Mill, the developing arts complex. The great luxury is being able to look out over the river and observe the ever changing weather and lighting conditions, as well as birdlife such as Grey Herons. You did you masters in Hull in 1996. Have you been back there since and what do you think of the cultural developments after it became Capital of Culture in 2016? I actually did my masters in Scarborough at the University College which was affiliated with Hull University at the time, I found both places wonderful to visit and study in, being situated on the North Coast with breath taking views of the estuary, sea and surrounding area. Hull has an impressive art collection at Ferens Art Gallery that I visit quite often and it is where I discovered the enigmatic painting A Game of Patience by the mostly forgotten early 20th century British Realist Meredith Frampton which I studied for my master’s dissertation. The focus on Hull’s music, theatre, dance and fine arts scene will do a great deal to highlight what the region has to offer people living in the area and visitors from all over the country, and it will be exciting to see the 2017 Turner Prize taking place in the Ferens. Looking back at my time spent studying painting in Scarborough was a very special and unique moment due to the fact that all the painting tutors were highly gifted practising professionals, this allowed me and fellow students to observe and take away an invaluable source of information on how to function as an artist in the outside world and produce work of lasting quality and relevance. I return to Scarborough every year as it has so much to offer, parts seem to have remained unspoilt since the Victorian era with its old harbour, castle remains overlooking the town and its Italian gardens on the South Cliff. Where do you get your influence from in your work? I am influenced by both past and present painters in the broad spectrum of the Realist tradition, in recent years there has been a reappraisal of the genius of Canaletto and his achievements in depicting the Italian urban environment, I viewed his paintings in the National gallery a few weeks ago. The precision and simplicity of his paint application in rendering architectural forms through the manipulation of light has a profound effect, it speaks of what can be achieved in the present moment with subject matter for today’s audience. I am also influenced by the whole classical notion of structure within the picture plain and an instinct to create order out of chaos, by discovering a natural order out of the everyday. The eye reads and gradually formulates a solution to this problem, I provide answers to this problem in a two-dimensional form. Even though I stated earlier Richard Estes as a recent revelation and a way forward I still feel that the discovery of the Greats (Raphael, Michelangelo, Velasquez, Rembrandt, Rubens, Leonardo, Ingres, Caravaggio for example) all those years ago has had an enduring influence and instilled in me a lifelong desire to create an illusion of the real, as a way of connecting with the world around me. You always paint traditional architecture, are you interested in modern architecture and is this some you would consider in the future? Definitely, my earlier New York paintings involved translating the iconic design of the skyscraper into a more timeless simplicity which had a suggestion of Egyptian culture, but these modern structures exist in most city environments across the world and it is something I am interested in exploring further in the future. 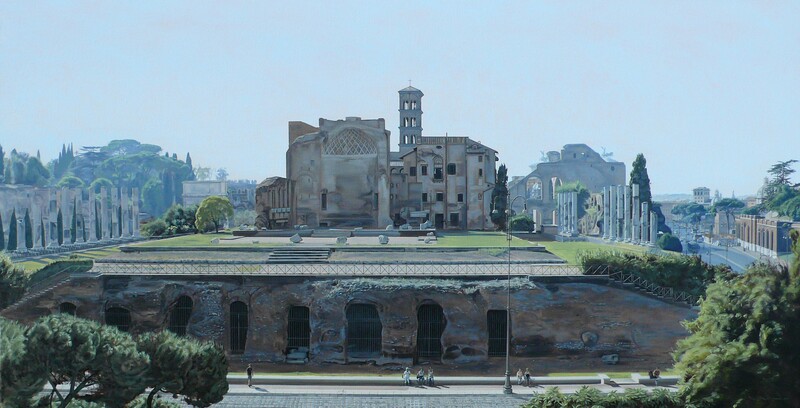 Focusing on juxtapositions between the modern and the ancient is always an approach which fascinates me because a tension surfaces between the two opposites. Two common characteristics within your work is the use of light and obtuse perspective, this draws the audience into your landscapes. Is this the reason behind this decision? I always ask myself how can I capture the spirit of a place and allow the audience to experience it like I did at the time? The sun’s light gives us the gift of life and we take this for granted, without it most living things on earth would not exist and we wouldn’t be able to truly see anything in the world, so I make a point of this in my work by using the time of day to reveal its significant qualities. As I get older I become more aware of my own mortality, light has an enigmatic and spiritual significance for me. Light is creation, something to celebrate and allows us to savour a specific moment in time, it has a profound effect on how we feel and how we view the world, in this respect there is still a thread of the subjective running through my work. Some of my paintings such as Tutto Passa may include the sharp angle of a building which plays a significant role in leading the viewers eye into the painting, in this particular scene everything depicted is as it was at that particular time of day, the strength of the main diagonal set against the verticals and horizontals is partly what drew me to this scene, as well as the drama of the evening light. The idea of the infinite and the possibilities this presents is also present, something which I explored a long time ago in my earlier work, so unconsciously these traits can resurface in present work, the complexity of an artist can never really be appreciated through the study of just a few paintings. There is an undeniable beauty in the simplistic which leads back to my awareness of classical construction within an image. Ultimately I always paint what appeals to me and if the audience connects with what I paint that’s a great bonus. Most of your paintings are accompanied by a study, can you explain why this is? Completing an initial study allows me the experience of physically and mentally preparing myself for completing the final larger scale work, any problems I encounter during this stage can therefore be solved. I like to be in control and prefer not to make any major alterations during the final painting stage as this can interfere with the purity of the image.